[unpad.ac.id, 11/11/2018] The Faculty of Communication Sciences (Fikom) student of Unpad won an achievement at the top of the “Ajisaka UGM” event held by the Corps of Communication Sciences of Gajah Mada University at Grand Cokro Hotel, Yogyakarta, Saturday (11/11) . 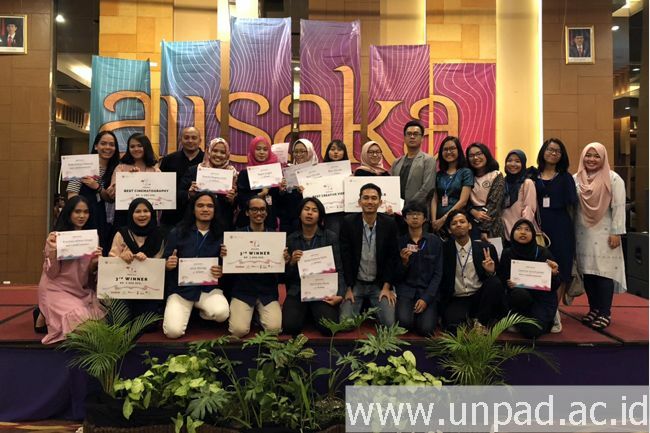 Unpad Faculty of Communication Science students won four ranks at the top of the “Ajisaka UGM” event organized by the Gajah Mada University Communication Science Student Corps at Grand Cokro Hotel, Yogyakarta, Saturday (11/11). Fikom students won awards from three competition branches from five competing branches. By winning this award, Unpad won the title “The Outstanding University”. The first award was won by two Journalistic Study Program students, namely Inal Anshar Razak and Refda Fachriza Malta who were part of the “Euphoria” team. The team won third place in the branch of the “Arjuna” competition or the Multi-Color Imagery Event. The second award was won from the “Nakula” competition branch or Youth Research: Research Competition. Diani Citra, Fatika Winanurizky, and Adina Hawani, three Communication Studies students who joined the team “Putu Ayu” won the championship in this branch. Besides winning, the team was also awarded the “best video”. Still in the Nakula competition branch, Unpad Faculty of Communication and Teams also won third place through “United Finders”. The team consisted of Azhar Ritonga, Regita Anggia, and Dzikrifa Ningtyas Aliifa, three students from the Communication Science Study Program.